With the depletion of higher-grade resources, metallurgical test work will continue to focus increasingly on lower-grade, more complex and refractory ores, as well as smaller deposits. Many of these can currently only be economically treated by heap leaching or heap bioleaching. However, due to their complexity, the technically and economically feasible operating windows for the heap leaching of these ores are small. For example, permeability constraints may limit the ore with respect to stacking height, limiting the maximum percolation rate and limiting air ingress (the latter obviously being important in the case of sulfides). Furthermore, the use of stronger lixiviant concentrations may result in unwanted gangue reactions. For these reasons, more accurate laboratory test work procedures are becoming necessary, whereby the limits of these smaller operating windows can be verified. Mintek is currently performing research work to further the state of the art in heap leaching by developing a more fundamental approach to heap leach research and development. Heap bioleaching of refractory chalcopyrite ores is being investigated by a few organisations, and Mintek is playing a prominent role in this area. 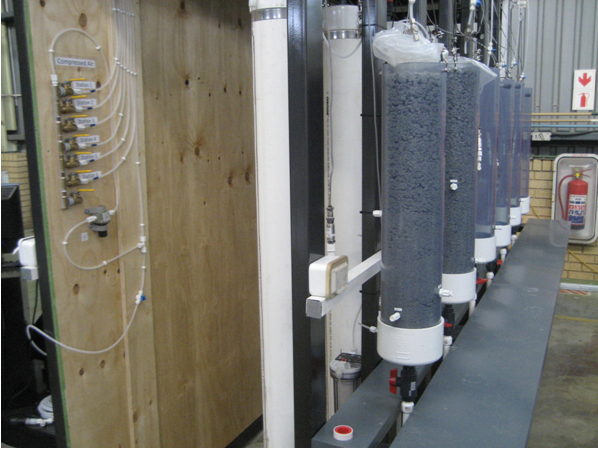 Mintek has devised trade-marked column leaching apparatus (SmartColumn™) for the simulation of the natural temperature profile development in pyrite-containing heaps, as part of research into chalcopyrite heap bioleaching. The results obtained in SmartColumn™ testing have been verified at pilot-plant scale. In addition to temperature modelling, the supply of air to the high temperature heaps is important due the requirement for pyrite oxidation and exothermic heat generation. The development of design criteria for air permeability and the development of methods for determination of gas-liquid mass transfer coefficients in columns is therefore a focus of the research effort. The engineering of heap leach plants can benefit from a more precise, quantitative specification of the maximum feasible irrigation and aeration rates as a function of heap stacking height. 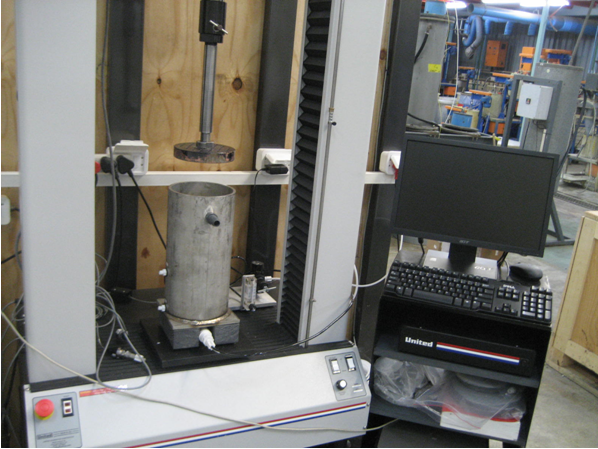 Typically, empirical flooding tests in columns are often used in combination with experience-based scaling factors to verify ore permeability. However, systematic geomechanical testing can provide a more quantifiable assessment of liquor and air permeability versus stacking height. A geomechanical test rig has been installed at Mintek and is used to characterise ores with respect to their permeability. Test work comprises “compression tests”, where the ore is compressed to simulate increasing lift overburden pressures in an envelope of ore at the bottom of the heap. The change in voidage and saturated solution conductivity as a function of lift height is then determined, and a quantification of drain-down moisture is obtained. In addition, “hydrodynamic column tests” allow the measurement of the degree of saturation as a function of percolation rate, which provides an indication of the percolation “regime” in which the heap leach is operating. Gangue chemistry plays an important role in heap leach applications, as it determines the reagent consumption and formation of precipitates. The focus of current research is to develop techniques and models for determining gangue reactions in heap leach ores. Mintek has developed dedicated equipment to perform gangue chemistry test work under controlled conditions. Test protocols are being developed for measuring gangue consumptions at controlled conditions, using newly-installed laboratory equipment. Based on the experimental data, rate equations are being developed for acid consumption and rate of mineral leaching as a function of temperature, particle size and pH level. The data and rate equations are used as inputs for a computer model, which will predict actual behaviour in a heap leach application based on data from test work and chemical assays.